Watch the CBSN Originals documentary, “Burmese Python Invasion: Fighting Invasive Species,” in the video player above. The full hour special premieres on CBSN Sunday, Oct. 28 at 11 p.m. and 2 a.m. ET. It’s been 26 years since Hurricane Andrew became the costliest storm in Florida’s history, but today residents of the Sunshine State are still paying the price in a way few would have imagined. 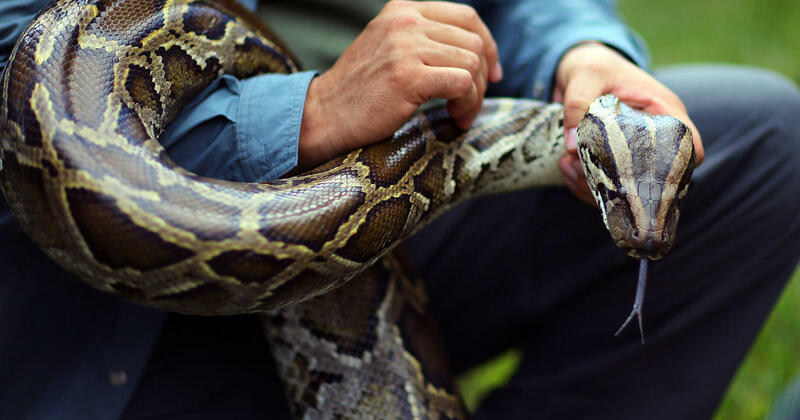 Captive Burmese pythons let loose by Andrew’s destruction have flourished in the southern Florida ecosystem, decimating local species in the process. And now there are signs this stubbornly invasive species may be poised to make its way beyond the state’s borders. Florida’s current python problem had its genesis about a decade before Andrew hit. Pet owners and exotic animals exhibitors in the U.S. had started importing the Southeast Asian Burmese python — among the top 5 largest snake species — for their size and novelty in this part of the world. However, caring for what can grow to be a 15- to 20-foot-long, 200-pound predator can become overwhelming and dangerous. Floridians who found themselves incapable of caring for their pythons relieved themselves of that burden by releasing the snakes into Florida’s Everglades, the largest wilderness area in the eastern U.S.
At 734 square miles, Everglades National Park is almost two-thirds the size of Rhode Island and filled with an abundance of wildlife. According to the National Park Service, it’s the most significant breeding ground for wading birds in North America. The Burmese python was first sighted in the Everglades in the 1980’s, but that turned out to be the calm before the storm. A Burmese python captured in Davie, Florida, in 2013. Today the Everglades are overrun with the giant snakes and it’s had devastating consequences. A 2012 study by the U.S. Geological Survey found that after Andrew exacerbated the Burmese python invasion of the Florida Everglades, populations of raccoons and opossums dropped roughly 99 percent and some species of rabbits and foxes effectively disappeared. Species that had long flourished here were being decimated by the aggressive newcomers. Invasive species are often able to thrive because they lack natural predators in their new environments, and these snakes are no exception. According to Donna Kalil, a state-sanctioned python hunter in the Everglades area, by the time they reach just 2 years old, the only species that can threaten pythons in the Everglades are alligators. “At this size, it can definitely take your cat and dog,” Kalil said of one specimen she caught. Full grown, a Burmese python could swallow a deer or even a human being, whole. “There’s not many things that a snake is going to think about. They’re going to say, ‘Predator or prey?’ Or, ‘Can I eat you or are you going to eat me?’,” Kalil said. Florida’s government has stepped in to try to control the burgeoning python population. In addition to contracting hunters like Kalil, they’ve allowed open season on the snakes all year long. Residents are authorized to catch and kill Burmese pythons by almost any means necessary, with no permit required, especially on private lands. It’s had some impact. As of May 2018, 1,000 Burmese pythons had been captured in Florida since the problem began. However, the python population has grown far faster than hunters can catch them. The snakes inhabit a vast area and reproduce rapidly. One female can lay up to 100 eggs a year and has a lifespan upwards of 15 years. Estimates of how many Burmese pythons now inhabit the Everglades range from tens of thousands to hundreds of thousands. With their numbers growing and their food supply dwindling, the pythons are expanding their territory. In November 2012, a Burmese python was spotted as far north as southern Georgia. The species’ spread is limited by temperature and other environmental conditions it needs to survive, but experts fear that climate change will eventually enable the snakes to migrate even farther north. Experts say once an invasive species gains a foothold in an ecosystem, it’s there to stay, often with devastating consequences. As Florida’s Burmese pythons multiply and expand their territory, they seem destined to become Hurricane Andrew’s most lasting — and unwelcome — legacy.